Categories: Autofeed Tools, Blind Rivet Pneudraulics, Kingset® System. 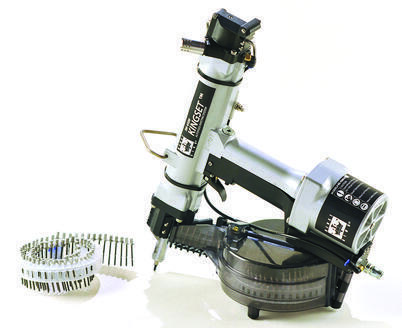 THE ABSOLUTE FASTEST AND MOST COST EFFECTIVE AUTOFEED RIVETING SOLUTION. Streamline your process and eliminate wasted time. STOP loading rivets one by one. Operators can now focus on hole alignment rather than picking the rivet from a box and placing the rivet in the nose piece. With the KingSet system, rivets are supplied on PE film which is fed through the nose of the riveter. Once the rivet is set, the next is auto-fed to the nose. The system reduces operator fatigue and significantly improves output. Ask us and we will prove it with a free demonstration at your facility.